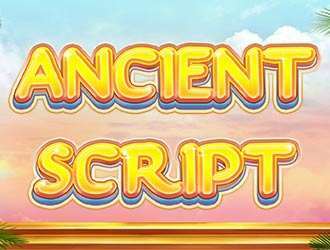 Discover and feel the exotic culture in this ancient Egypt-themed slot game known as Ancient Script. It has 10 fixed payline to ensure greater chances of winning. Not forgetting the theme related symbols, like the golden pyramids, the Eye of Horus, golden amulets, the mask of Tutankhamun, players can now spin and explore the rich ancient Egypt culture. You begin playing Ancient Script by spinning three wild symbols on the reel which triggers three free spins. With every free spin, you get rewarded with the Expanding Wild feature which then causes the reels to fill up and increases your winning potentials. The free spin triggers regularly during the game and this also gives you a greater chance of winning. You can also explore the hands-free spinning in this slot game. This is done when you click on the ‘auto’ button on the screen. The auto spin allows you to play as much as 100 spins automatically and gives you a chance to set your win and loss limits. The Golden Pyramid Symbol: this is the highest paying symbol with a payline of 400× your bet per 5 matching symbols. The Eye of the Horus: Here, for 5 matching symbols, you get 200× your bet. The Instrument: This pays up to 150× your wager. The Golden Amulet: this rewards you with 100× your bet. The Colourful High Card Symbol: These symbols offer the lowest payouts. The Ace rewards you with 90× your bet, the King 80× your bet, the Queen 70× your bet, the Jack offers 70× your bet and finally the 10 rewards you with 50× your bet. Ancient Script is definitely a fun game with its ancient Egypt theme plus the exotic background music which serenade you while you spin. Though there are no bonuses, its Wild symbols and features help to make up for that lack.